APL, in partnership with the Medical Department of the Lycée will be happy to invite you to the next conference for parent of the Lycée and all its Primary schools. The conference will take place on Monday 21st january in the Lycée, salle Iselin. 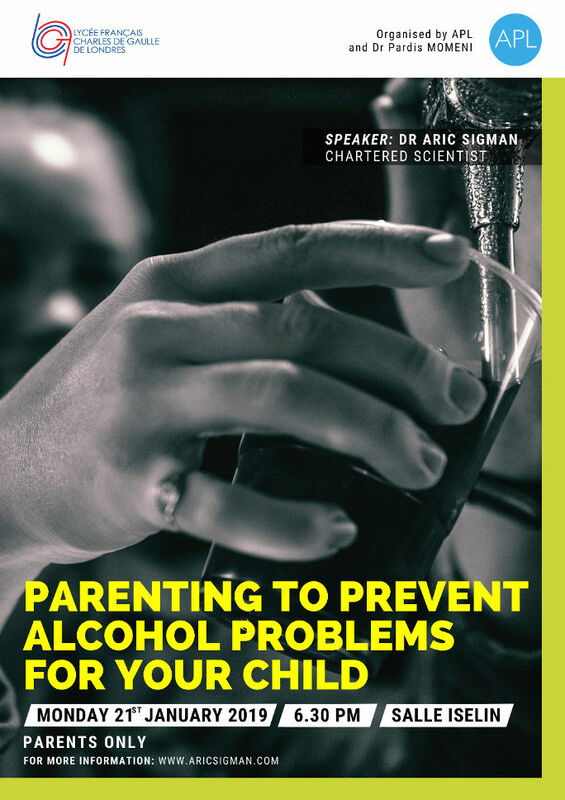 Dr Aric Sigman will speak about the probleme of alcohol amongst young people. The conference is for parents only and in English. Please note that on that day all pupils 3eme or 3eme GCSE will attend a conference on the same subject. Parents are welcome to join us for a drink from 6pm before the conference starts at 6:30pm. Access through 35 Cromwell Road.